This set is gorgeous and good quality. I purchased it for a shower gift. It made it in plenty of time for the baby shower. This set is beautiful and the recipient loved it!!! This user was entered into a sweepstakes after submitting their honest review. Amelia 4 Piece Crib Bedding set has all that your little bundle of joy will need. Let the little one in your home settle down to sleep in this incredible nursery set. 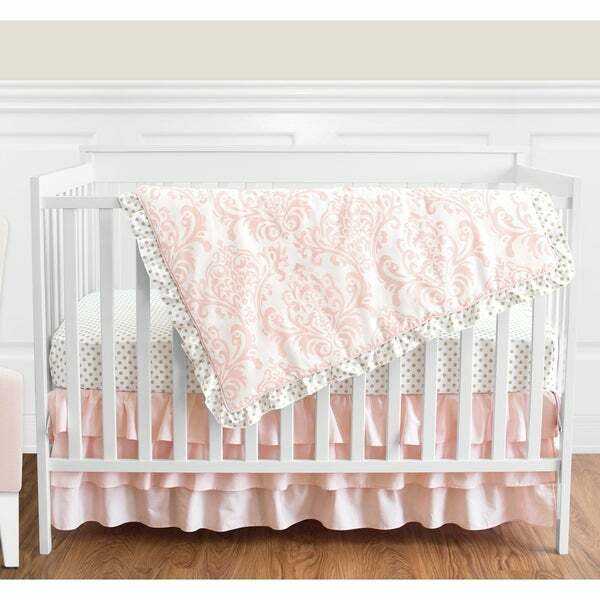 This baby girl bedding set features a delicate damask and a coordinating metallic polka dot. This collection uses the stylish colors of blush pink, gold and white. The design uses 100% cotton fabrics that are machine washable for easy care. This wonderful set will fit most standard cribs and toddler beds. Crib set includes: Crib Comforter, Fitted Sheet, Crib Skirt (Dust Ruffle), Diaper Stacker. This set is gorgeous and good quality. I purchased it for a shower gift. It made it in plenty of time for the baby shower. This set is beautiful and the recipient loved it!!! "3 fitted sheets are shown in the picture. Does the set come with all 3? If not which one does it come with? "